For nearly a century, Democrats far and wide have called for government provided healthcare to varying degrees. The first of these policies that were eventually passed by Congress were Medicare and Medicaid, which have been largely successful in accomplishing what they sought to accomplish: minimizing or eliminating healthcare expense for the elderly and for the poor. Since then, major healthcare reform has been a talking point in virtually every Congress, but has failed to make any substantive progress; with the exception of the current administration that, five years ago, passed the Affordable Care Act (ACA). The ACA has been the source of a very contentious debate about the role of government in our society, and whether we have experienced an infringement on our individual liberty when submitting to the requirements of the new law that force every individual to have health insurance in some capacity. The new law, in conjunction with the Medicaid expansion that extended Medicaid qualification to a much larger segment of the population, also made health insurance affordable or free to a large number of Americans; finally bringing the prospect of health insurance into the realm of possibility for many families that had never thought it possible before. But do Americans value the idea of health insurance? Is it important to most people? And if so, do most Americans associate the idea of healthcare accessibility with the Democratic Party? These are the questions this study seeks to answer. It is hypothesized that citizens who are uninsured value health insurance, and are more likely to vote for the Democratic Party in order to ensure that health insurance becomes more accessible to them either through the legal framework or for financial reasons. To answer this question, data was obtained from the County Health Rankings website for the state of Iowa. This yearly publication has a multitude of health and demographic variables that this organization combines and weights accordingly to produce a ranking for each county. Refer to the below section for the identification of variables used as well as their definition. Voting data was also obtained through the office of the Iowa Secretary of State for the 2014 Senate election for every county in Iowa and for every candidate in the race including write-in votes. This data was paired with the previously mentioned data for each county, and a regression analysis was performed using several different models. H1: People who are uninsured are more likely to vote Democrat because an integral component of the national Democrat platform is healthcare accessibility. %VoteDemocrat is the percentage of votes that were cast for the Democratic Party’s candidate Bruce Braley in the 2014 Iowa Senate election. %Uninsured is the percentage of the population by county under the age of 65 that does not have health insurance. %Unemployed is the unemployment rate by county. %Over65 is the percentage of the county’s population that is over 65 years of age. %Black is the percentage of the county’s population that is African American. %VoterTurnout is the percentage of county’s population that voted in the election. MedianIncome is the median income of the county. All of these variables are founded in the theory behind this research, and all corroborate with historically held beliefs and empirical findings regarding American elections. First, unemployed citizens are one of the most reliable parts of the electorate for Democratic candidates. The Democratic platform consistently pushes greater benefits for the unemployed, which is one of the larger components of the at-large social safety net of the United States. This could have developed into a self-fulfilling prophecy since Franklin Roosevelt enacted the first unemployment programs in the early 1930’s, as Democratic candidates came to find that the unemployed almost always voted for them. Thus perhaps it is the case that Democrat politicians seek to expand unemployment benefits to reinforce the support of the unemployed for the party, and the unemployed continue to support the Democratic Party because they foresee an expansion to their unemployment benefits. This is an interesting thought-experiment, but for the purposes of this study it is only important to bear in mind that the unemployed consistently vote Democrat, and this is why the theorized equation has a positive β2. It is well known and documented that the elderly, members of the “Silent Generation,” have overwhelmingly voted Republican during the last decade. The Silent Generation is “the generation that is most strongly disapproving of Barack Obama,” and “was once the most Democratic [generation], but is now the most Republican,” (Pew Research Center, 2011). For this reason, the elderly composition of each Iowan county can be controlled for, which will help to explain variability in the Democrat vote. Because it is known that the elderly vote Republican, the theorized equation has a negative β3. On that same note, Blacks have been one of the most reliable demographics for Democrat support since the Civil Rights Movement of the 1960’s, and in some places for longer than that. This is why the regression equation has a positive β4. The income variable is theorized to have a negative coefficient because it is suspected that wealthier places tend to vote Republican, for essentially the same reasons that it was explained that the unemployed vote for Democrats. Democrats tend to have platforms that benefit the poor and lower classes, and frequently rely on them to mobilize to win elections. Also, it is documented that, nominally, there are more citizens that self-identify as Democrats in the United States than Republicans, though this statistic takes an unusual turn when more identify as conservative than liberal. This is the reason that Democrat candidates place more emphasis on voter mobilization efforts, as the very voters they count on to win the election are typically the same voters that fail to show up to vote. Thus, the turnout variable has a positive coefficient; meaning that greater turnout will benefit the Democrat Party. The results from Stata largely confirm the hypothesized effects of each variable, except for the one we are specifically looking at: the percentage of uninsured. These results indicate, with a statistically significant p-value of 0.075 in the complete model, that the greater the percentage of uninsured, the less votes the democratic candidate received. This means that, while we are controlling for many other factors, uninsured citizens tended to vote for the Republican candidate in the 2014 Senate election in Iowa, Joni Ernst. Bear in mind that Joni Ernst was the candidate that was staunchly opposed to the Affordable Care Act, and by logical extension, expanded healthcare access and accessible health insurance for those that had none. 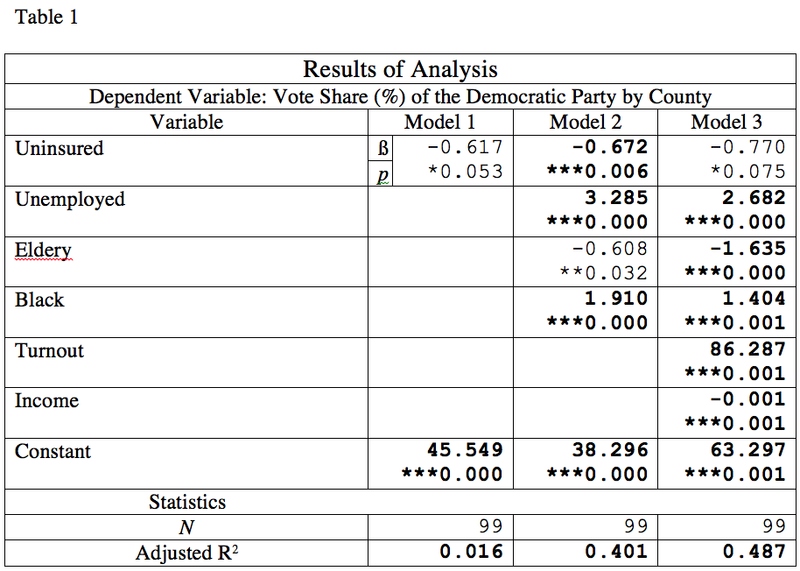 Note that in Model 1, the adjusted R2 is only 0.016, meaning that the idea of being uninsured or not only explained 1.6% of the variability in the voting percentage for the Democrat candidate. This means that being uninsured means virtually nothing in the context of elections, but when it does matter the voter will be more likely to vote for the Republican than for the Democrat. What a bizarre finding. As theorized, the results confirm that the unemployed and black voters strongly voted for the Democrat candidate, and the elderly and the wealthy tended to vote for the Republican candidate. Voter turnout also had a positive effect on Democrat vote. After generating a correlation matrix, we are confident that we have no problems with multicollinearity in the model. The greatest correlation among variables is the relationship between unemployed and income, -0.601, but this is to be expected and the correlation is not necessarily high enough that it should be a cause for worry. Though the findings of this model and analysis are interesting, we must be very careful in holding any of these results as truth. The adjusted R2 is only 0.487, which means that there are other variables lurking somewhere that would explain the other 51.3% of the variance in why people voted for Democrat candidate Bruce Braley in the 2014 Iowa Senate election. This model largely reinforced previous research that has shown time and time again that the elderly and wealthy vote for Republicans, and blacks and unemployed vote for Democrats. The idea of uninsured people voting for the candidate that would instill further legal roadblocks in their way of getting health insurance is bizarre; but if one considers the type of people that still do not have health insurance through the ACA, perhaps one may find some answers. Whatever the hypothesized reason, to prove that the uninsured do not value the prospect of health insurance and do not vote for Democrats because of that, this claim needs far more research; research that uses data over time and data nationwide. ← DO VOTERS HOLD THE PRESIDENT AND GOVERNORS ACCOUNTABLE TO ECONOMIC PERFORMANCE? NOT REALLY.